Put away that microphone – a marker is two turntables’ best friend. 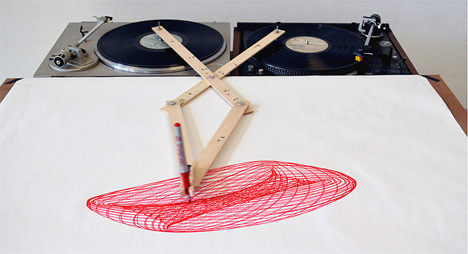 Robert Howsare‘s Drawing Apparatus puts them to work, unplugged this time (sort of). Howsare fitted together a few thin pieces of pine to create hinges which bend with the natural rotation of a turntable. These wood pieces are placed at two different positions on two separate LPs. One end of the mechanism stays situated on the center of one record, where the label would be, while the other end is placed on another record’s grooves, sending this end on an elliptical route. A marker is placed where the two ends meet. 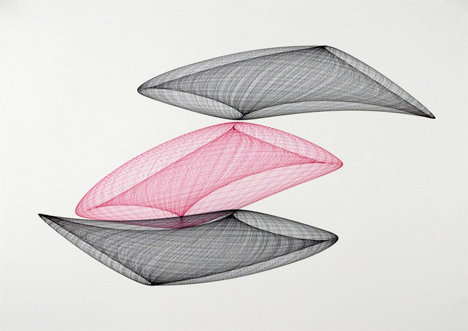 The resulting print is reminiscent of the art created by Sprirograph toys, although Howsare has a more philosophical goal for his Drawing Apparatus. “The drawings become documentation of the performance, reminding the viewer of the mechanisms and sounds of the apparatus at work,” he says on his website. See more in Do It Yourself or under Technology. May, 2013.